Citizen Kane (1941) was initially a box-office failure, but it went on to be nominated for nine US Film Academy Awards (Oscars) and become one of the most famous movies ever made. Critics and film scholars have been almost uniform in their praise – it regularly topped Sight and Sound’s poll of critics, conducted very ten years from 1962 to 2002, and it topped the American Film Institute’s lists of greatest movies in 1998 and 2007. 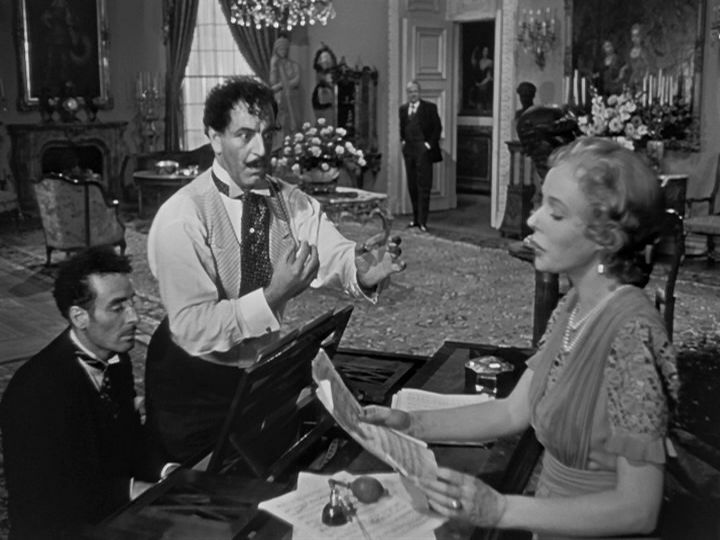 And even the making of the film has been the subject of numerous book-length studies [1,2,3,4] and Oscar-nominated documentary films (e.g., The Battle Over Citizen Kane, (1996). 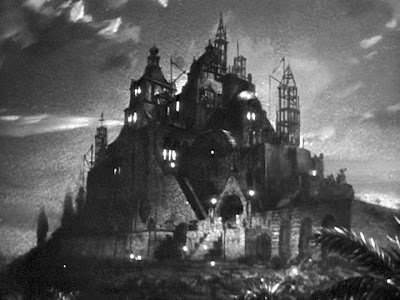 Controversy over the making of the film has primarily been concerned with (a) efforts on the part of newspaper publisher William Randolph Hearst, on whose life much of the film’s material is based, to limit the film’s distribution and (b) questions about the degree to which the 25-year-old Orson Welles, who produced, directed, and starred in the film, deserved credit for also being the co-author of the script. I won’t go into those issues, here, but I think it’s fair to say that the film was a technical marvel and had a revolutionary effect on subsequent film expression for many top filmmakers. But my concern here is not so much on how the filmmakers achieved their superb effects (which were amazing, given the technical constraints of the day under which they operated), but is instead on how the film looks to a modern audience today. 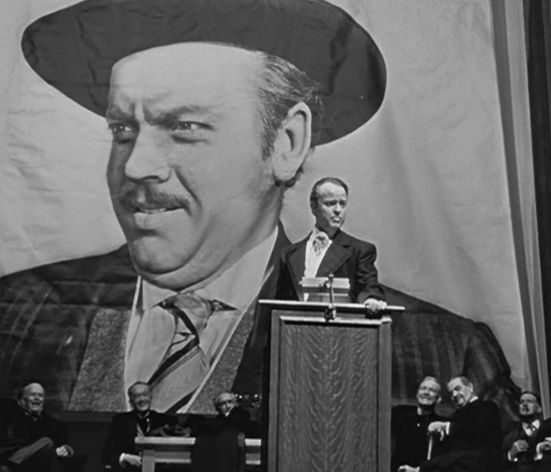 The story of Citizen Kane is a character study over the life and career of a wealthy and ambitious newspaper magnate. For legal reasons the film purports to be a fictionalized account, but there is no doubt that this portrait is very much based on the life of William Randolph Heart, a famous contemporary figure and, to a lesser extent, on the life of Samuel Insull, another wealthy magnate. So one might expect that this production would take the form of a documentary film with an attempt to give a realistic account of a historical figure (and indeed Citizen Kane starts off under the pretense of a documentary). 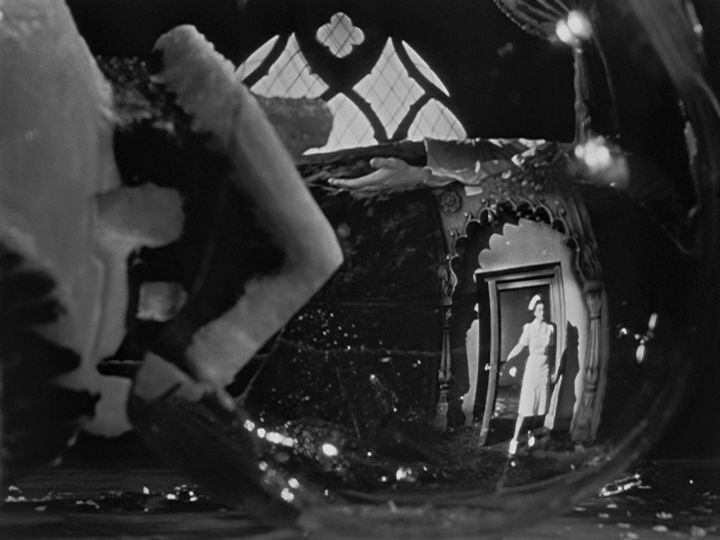 But instead of delivering documentary realism, Citizen Kane comes up with one of the all-time great presentations of expressionistic filmmaking. How Orson Welles accomplished such a feat is still amazing to consider. He said that in preparation for his first film directorial effort (he was already a theatrical stage actor and producer), he privately watched John Ford’s film Stage Coach (1939) some forty times, with a varying collection of technical professionals on hand to give him advice on how effects were achieved. 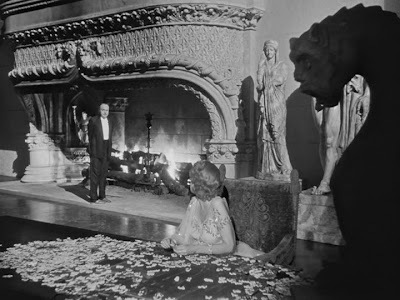 Irrespective of who deserves credit for what, Welles had an estimable collection of professionals working on the production staff as collaborators, including cinematographer Gregg Toland, film editor Robert Wise, and musical composer Bernard Herrmann – and, of course, scriptwriter Herman Mankiewicz. 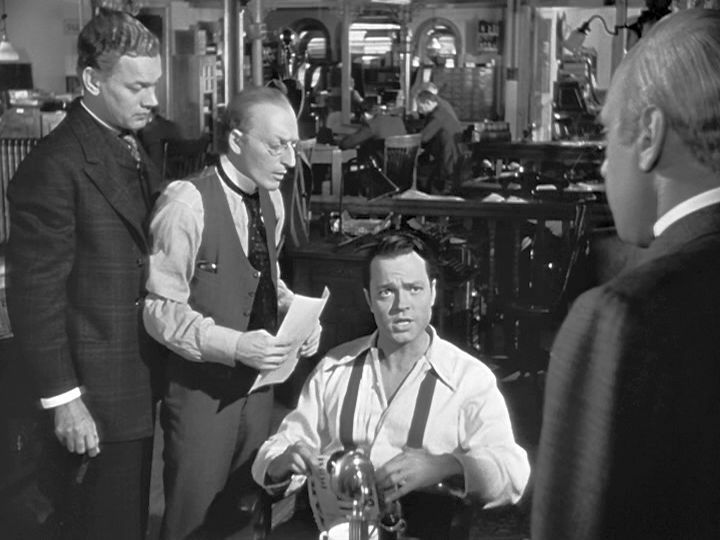 What this team came up with was a dazzling display of various effects that worked together to achieve the expressionistic presentation of a psychological investigation – who was Charles Foster Kane, and what did he ultimately seek? the moody and emphatic music, both onscreen and off, of Bernard Herrmann. The “News on the March” Movie Newsreel Narrative (13 minutes) is a presumably objective overview of Kane’s entire life as seen by the public. The Walter Thatcher Narrative (28 minutes) is a relatively objective, external account that outlines Kane’s rise as newspaperman and crusader for public causes as seen from the perspective of the wealthy banker, Walter Park Thatcher (George Coulouris). The Bernstein Narrative (20 minutes) covers the early years (roughly 1888 to 1902) of Kane’s career as seen from the sympathetic perspective of Kane’s loyal assistant, Mr. Bernstein. This is a more personal perspective and sees Kane as a charismatic personality. The Jed Leland Narrative (24 minutes) covers the next sixteen years are so from the perspective of Kane’s best friend, Jedediah Leland (Joseph Cotton). Leland is moralistic and critical of Kane’s ultimate purposes, which he condemns as narcissistic. 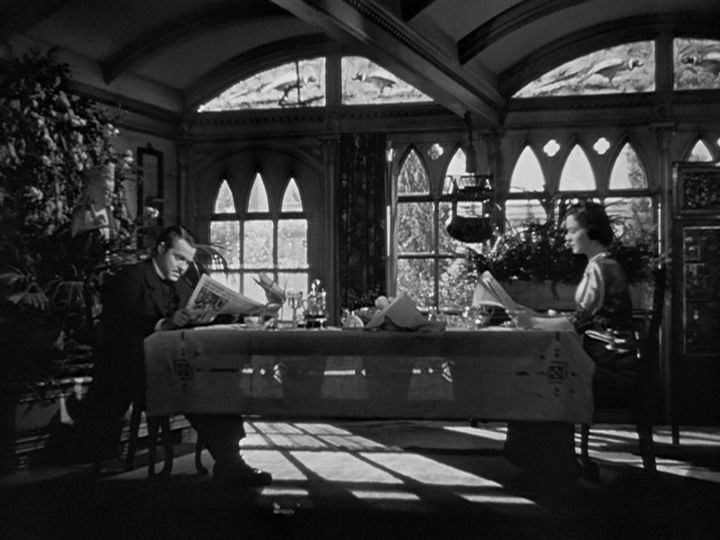 The Susan Alexander Narrative (32 minutes) covers Kane’s declining years when he was married to his second wife, Susan Alexander (Dorothy Comingore). This is a newsreel produced by the movie magazine journalists that presents a presumably objective overview of Kane’s entire life as seen by the public. Kane married the US President’s niece in 1902, but she left him in 1916 on account of his affair with a lower-class woman, the public revelation of which ruined Kane’s political career. In 1918 his wife and young son were killed in an auto accident, but by this time Kane was married to the other woman, who aspired to be an opera singer. After the Stock Market Crash of 1929 dismembered his newspaper empire, Kane retired to his vast and never-finished castle-like estate, “Xanadu”, and gradually became a recluse. Jerry Thompson now consults the private library of Walter Thatcher, Kane’s original guardian and financial manager. Born to a poor family, Kane had inherited enormous wealth at the age of eight (“the world’s sixth largest private fortune”), and Thatcher, a stuffy banker from New York, was the one who looked after Kane’s holdings while the boy grew up. When Kane reached the age of twenty-five and assumed control over his financial empire, he immediately bought a newspaper, the New York Inquirer, and began his career of yellow journalism. Like the first narrative, this account is also relatively mater-of-fact, and it includes one of those famous time-transition scenes: Thatcher says “Merry Christmas . . . “ to Kane when he is eight years old, and then the shot dissolves into Thatcher, now visibly older, continuing the phrase by saying, “. . . and a Happy New Year!”. Seventeen years pass by in one continuous dissolve. Although in this sequence Thatcher shows himself to be horrified at becoming a key target of Kane’s public crusades against financial cronyism, the viewer is given a rather sympathetic portrayal of Kane as an idealistic spokesman for the public good. There is another one of those time-capsuling dissolves in this section when a photo showing the staff of Kane’s rival New York newspaper, The Chronicle, dissolves into an essentially identical photo six years later showing that they had all been bought by Kane’s money to go work for the The Inquirer. This section also features perhaps the best scene in the film: a staff party at The Inquirer celebrating the success of the newspaper. There are brilliantly composed shots here featuring sound and visual combinations across multiple parties and in depth – such as one showing Kane dancing with hired chorus girls in the background while Leland expresses his doubts to Bernstein in the foreground. Essentially this narrative, which closes with the news that Kane has married the US President’s niece, reflects Bernstein’s loyally supportive view and shows Kane to be charismatic, idealistic, and effective. He is at his high-water mark. Continuing his search, Thompson visits a retirement to interview Jedediah Leland, who had long been Kane’s best friend and had worked for Kane newspapers as a drama critic. There is another famous time-capsuled multiple-dissolve scene here, which measures the decline of Kane’s marriage by showing Kane and his wife, Emily (Ruth Warrick), in a series of similar shots at the breakfast table but spread out over sixteen years. This section also recounts his early affair with Susan Alexander, who serenaded Kane with her singing voice, and how this affair led to the end of Kane’s promising political career in 1916. Leland blamed Kane for not following his own stated principles, and there is an interesting scene comprising three long (93, 96, and 70 seconds in length), low-angle moving-camera shots showing Leland vocalizing his criticisms and asking to be transferred to the Chicago newspaper. But this turned out not be a safe enough distance for Leland, and an outspokenly critical column of his criticizing Susan Alexander’s opera performance led to his dismissal and a termination of his relationship with Kane. Still searching for something about “rosebud”, Thompson visits Susan Alexander at her nightclub, which she operated after divorcing Kane. This dreary account shows two people with little in common and the resulting boredom of their life together. 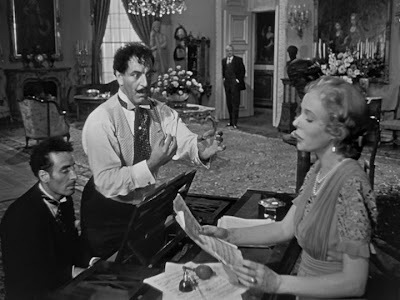 Kane stubbornly tried to push Susan’s singing career, but the poor woman had neither the will nor the talent to be successful and only became miserable as a result. 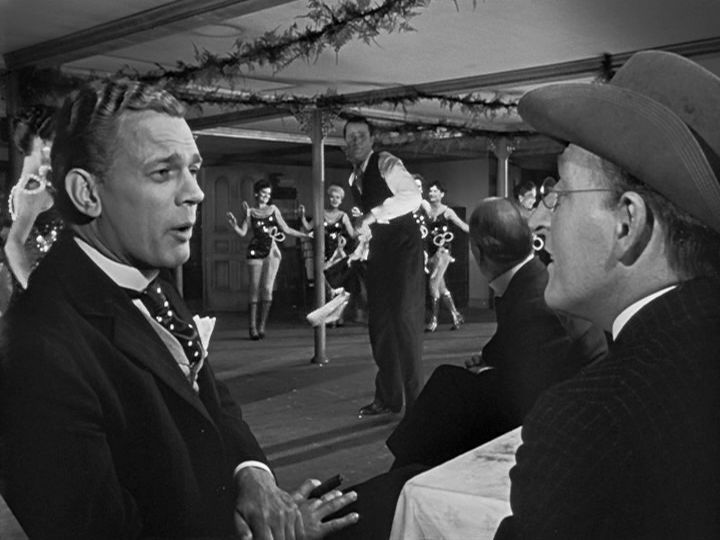 In the closing scenes, Thompson never finds out anything about “rosebud”, although he has learned quite a bit about Kane’s life. In the final images, though, the viewer is shown the key to what “rosebud” meant nominally and can speculate what its metaphorical significance was to Kane. Thus each of the five narratives shows succeeding portions of Kane’s life from progressively narrower and more personal perspectives. The early narratives provide the public view, while the later narratives offer successively more intimate and critical views of Kane. Leland criticized Kane as wanting to be loved rather than offering his own love unconditionally. Susan Alexander felt she was merely an accessory to Kane’s own grandiose ambitions. So as the focus progressively narrows, Kane is shown to be essentially hollow and selfishly unaware of what the people around him wanted. 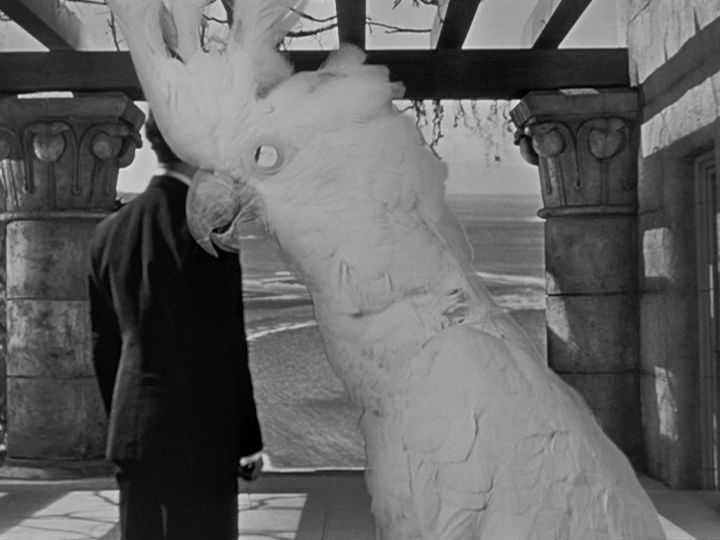 On the whole and despite some extraordinarily powerful expressionistic elements to the story, not everything is ideal in Citizen Kane. The Susan Alexander section is too long and drains some of the narrative momentum that had been built up in earlier sections. The character study of Kane is not entirely convincing, either. If we take a step back from the emotionally colored material presented to us, we can perhaps be a bit more sympathetic to Kane. After all, some presumably key events in Kane’s life are merely alluded to, such as his courtship with Emily and the tragic death of Emily and his son. So we only get a prejudiced selection of events, and other events were of little concern to the narrators talking about Kane, so they are not covered in their accounts. Leland and Susan Alexander, when you reflect on them, are rather selfish, too. They seem to have little empathy for Kane and little interest in making him happy. They merely criticize him for not doing enough to fulfill their own desires, and they offer little in return. And how different were Kane’s dogged attempts to propel Susan Alexander’s career from the currently popular “positive” American attitude of never giving up on one’s goal, as is projected by US star sportsmen such as Michael Jordan? Kane’s never-give-up determination must have been crucially responsible for some successes in his life, too, no? In fact as a character study, I would consider the depiction of Nader in Farhadi’s A Sepaaration (2011) to be far more subtle and revealing than what is shown in Citizen Kane. Nevertheless, there is something interesting about placing the viewer in the vicarious role of a reporter seeking to extract a kernel of truth from a succession of prejudicial accounts – and this style of truth extraction came well before its cruder portrayal of Rashomon (1950). 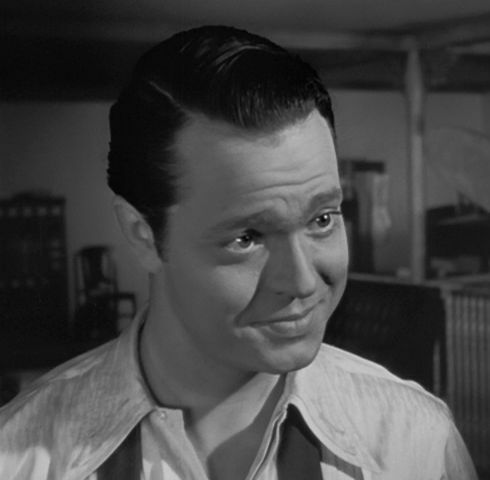 But anyway it’s not the character study, by itself, that makes Citizen Kane a great film. What is great about the film is its expressionistic immersion of the viewer into quasi-nightmarish emotional environments as felt by the various people that Thompson talks to. This is the same kind of effect that has powered film noir, and it is no wonder that Citizen Kane had a powerful effect on subsequent film noir productions. After all, films are not really about reality; they more accurately reflect our dreams and nightmares. Kael, Pauline (ed. ), The Citizen Kane Book, Little and Brown, Boston, (1971). Ronald Gottesman, Perspectives on Citizen Kane, G.K. Hall & Co., New York, ISBN 978-0-8161-1616-4, (1996). Robert L. Carringer, The Making of Citizen Kane, Berkeley and Los Angeles: University of California Press, ISBN 0-520-05367-2, (1996). Laura Mulvey, Citizen Kane, British Film Institute, London, ISBN 0-85170-339-9, (1992). Lana Lam, "EXCLUSIVE: Whistle-blower Edward Snowden talks to South China Morning Post", South China Morning Post, 13 June 2013, (http://www.scmp.com/news/hong-kong/article/1259335/exclusive-whistle-blower-edward-snowden-talks-south-china-morning).